The controversy always comes with Viktor & Rolf. 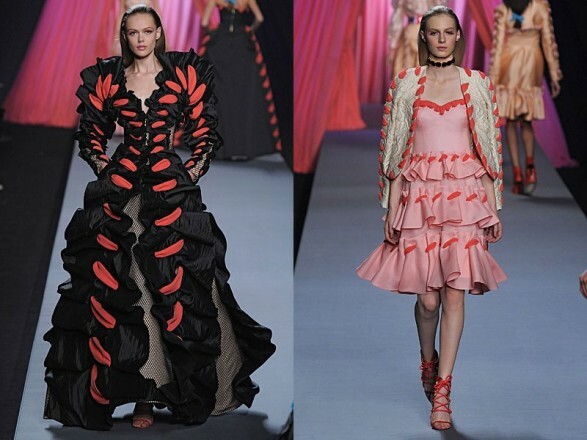 Votes and votes against a fall towards the latter becoming increasingly clear that his last Spring-Summer 2012 presented at the Fashion Week Paris fail to change course. Apart from staging, with the models coming out very long under the skirts of a giant woman, surrealism was this time at home. For me it is a futuristic style between Rococo and exaggerated. A continuous love and I cannot. By the time they are 50 and again for other places to Vivienne Westwood. Many geometric shape, high gloss, long wheel and mix of fabrics. In their latest collections may be the less I liked it.